Bangalore: Container shipping operators have started shutting services to the US and Europe as poor cargo volumes and declining freight rates begin to take their toll. A consortium of four shipping firms that runs a direct weekly service from Jawaharlal Nehru Port, the country’s biggest, to the US east coast, has decided to shut services from 4 January as consumers in the world’s largest economy cut consumption. The US east coast accounts for about 75% of India’s exports to that country. Another service to Europe, the Asia Europe Container Service 1 (AEC 1), was discontinued on 9 December, 20 days after it was launched by Hanjin Shipping and UASC. 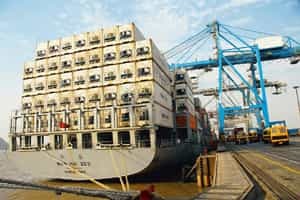 The AEC 1 connected Jawaharlal Nehru Port and Port of Pipavav on India’s west coast with top European ports such as Antwerp, Thamesport, Hamburg and Rotterdam. “We have discontinued the AEC 1 service and will shut down the Sina service from January due to poor volumes," said S.H. Lee, managing director of Hanjin Shipping India Pvt. Ltd, the Indian unit of the South Korean firm. Sina is the second container shipping service from India to US east coast ports—such as New York, Charleston, Damietta, Norfolk and Savannah—that has been withdrawn this year. In March, state-owned Shipping Corp. of India Ltd (SCI), Zim Integrated Shipping Services Ltd, Orient Overseas Container Line Ltd and Emirates Shipping Line FZE, discontinued the IDX service for the same reasons. “This clearly shows that container shipping firms are not making money," said an executive at German container ship operator Hapag-Lloyd AG, who didn’t want to be named as he’s not the company’s official spokesman. The freight rate for moving a 20ft cargo container, or TEU, from India to the US east coast has declined to $1,200-1,300 (about Rs56,400-61,100) from $2,500-2,600 two years ago. Freight rates to Europe have declined 40% to $600-700 per TEU from $1,050-1,100 some months earlier. TEU stands for twenty-foot equivalent units, and is an industry measure of capacity of a container. “The Christmas shopping season in the West has come and gone," said an executive at SCI, India’s largest shipping firm and the only one that owns and operates container ships. “The writing is on the wall for container shipping firms. We are bleeding to death." Another executive at Japan’s NYK Line said that container cargo volume growth to the US has remained flat this year compared with 2007. Both executives declined to be identified as their companies have not authorized them to speak with the media. India exported 177,828 forty-foot equivalent units (FEUs) to the US in 2007, 6% less than the 189,249 FEUs it sent to that country in 2006. An FEU is double the size of a TEU. Container volumes for 2008, which will be available sometime in February, are expected to be at 2007 levels or lower, according to shipping analysts. The suspension of the Sina service is expected to stabilize rates for other firms running ships on the Indo-US sector because it would reduce capacity by 10-15%. “When capacity is taken out of a trade sector, the freight rates will stabilize," the SCI executive quoted earlier said. Cargo volumes at major US container ports are estimated to be the slowest since 2004 as the downturn in the American economy continues, according to the monthly Port Tracker report released by the US-based retail trade association National Retail Federation and IHS Global Insight. Cargo volume in the US is projected at 15.3 million TEUs for the year, a 7.1% decline from the 16.5 million TEUs in 2007 and the lowest since 2004, when 14 million TEUs moved through US ports. “Retail sales forecasts this year are the lowest they’ve been in more than five years, and the cargo volume we’re seeing reflects those numbers," said Jonathan Gold, vice-president at the National Retail Foundation.